Kit include 3 Premium EMQ quality Motor Bearings. Bearings are built from Chromium Steel with both sides rubber sealed. This kit has 3 bearings that will work on most pump motors. You will only use 2 of the bearings. The kit will fit the 56 frame and 48 frame standard residential pool pump motors. This kit will not work on all of the commercial pumps. If you have your motor apart, then the part number should be stamped on the bearing. When your motor makes a loud noise, sometimes very shrill, it is because the motor shaft bearings are bad. I reccommend that replacing bearing should be done by a professional motor repair serviceman. But we have sold bearings to pool owners and they have installed them. The bearings have a single row deep groove. Ball bearings have double non-contact seals with high temperature lubricant. They will provide quiet long life performance, with minimal vibration. It is easy to tell when your pump motor bearings are going bad. The motor will be making a loud noise. The following is a generic bearing replacement and common sense will be needed for your project. Replacing a bearing should not be a rush job and if you are not confident, take the motor to an electric motor repair service center. 1)	When replacing bearings, remove the wet end of the pump. If in doubt, get a pump schematic of your model of pump. 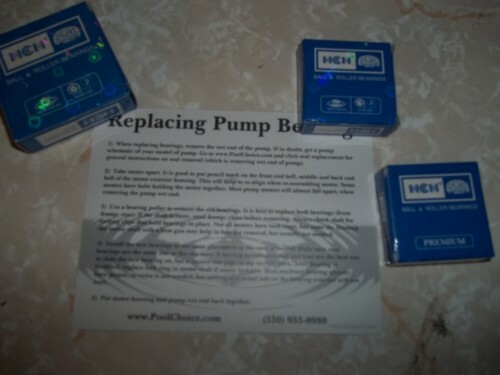 Go to www.PoolChoice.com and click seal replacement for general instructions on seal removal (which is removing wet end of pump). 2)	Take motor apart. It is good to put pencil mark on the front end bell, middle and back end bell of the motor exterior housing. This will help to re-align when re-assembling motor. Some motors have bolts holding the motor together. Most pump motors will almost fall apart, when removing the pump wet end. 3)	Use a bearing puller to remove the old bearings. It is best to replace both bearings (front & rear). If the shaft is rusty, sand (with emery cloth) & clean before removing. Always check shaft for locking clips that hold bearings in place. Not all motors have lock rings, but some do. Heating the motor shaft with a heat gun may help in bearing removal, but usually not needed. 4)	Install the new bearings to the same placement as the ones removed. Make sure new bearings are the same size as the old ones. A bearing installation tool and heat are the best way to slide the new bearing on, but a correct size pipe to tap on will work. After bearing is installed, replace lock ring in motor shaft ,if motor had one. Most enclosed bearing already have grease, so extra is not needed, but adding additional dab on the bearing exterior will not hurt. 5)Put motor housing and pump wet end back together.